FTC Disclosure: I received a copy of this book in exchange for review. No money changed hands and all opinions presented here are my own. Here’s something not many people know about me: I used to wait tables. It wasn’t something I did for very long, thank goodness, but I was rather good at it, if my tips were any accurate measure of such a thing. I came home from work dead tired and drained, but I was making great money. I had had no training whatsoever, and it wasn’t a job I was interested in keeping, but I was doing very well at it. Here’s why: waiting is customer service. That’s it. Once you wrap your head around that, it becomes a lot less intimidating. You might think the most important thing is to get the food to your tables quickly, or to make sure you’re refilling drinks before they have to ask, or to make pleasant conversation, and all of those are certainly good things, yes, but ultimately you’re there to, as Simon and Garfunkel once put it, keep the customer satisfied. When that’s your priority, the job goes a lot more smoothly. Why? Because mistakes happen. That’s inevitable. Plates come out late. Steak is overcooked. Nobody told you you’re out of roasted beets. It happens, no matter how good a waiter you are, so you shouldn’t bank on providing a “perfect” dining experience. You can’t. You bank on providing a “pleasant” one, where mistakes are responded to in a professional and courteous way. As a diner you may not even remember all of the times you went out for a meal and had everything go silently right…but you will remember that one waiter who had to deal with something going wrong, and made it up to you. That sticks. That’s good service. What Steve means by this is kind of what I was getting at above: you can’t be Superman. * He’s not calling you a bad waiter because he thinks you show up to work reeking of cigarette smoke and scream profanities at customers you don’t like. 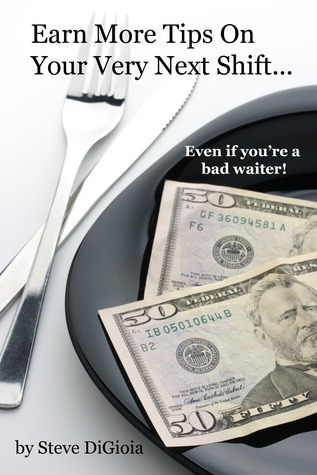 He’s calling you a bad waiter because…well, you probably think you are. And if you think you are, you’re never going to get better, because it’s not a question of “being a bad waiter” so much as it is not being aware of how to improve. Steve’s approach is interesting, because he doesn’t expect you to turn into a champion waiter overnight, or ever. Instead he lays out around twenty brief chapters of small adjustments you can make that will increase customer satisfaction. That’s all. Why? Because you’re in customer service. And that’s the whole point. I like Steve’s advice, because it’s realistic. In the chapter about wine he doesn’t lay out every type and what it complements and how to describe it and demand that you memorize everything he says…instead, he instructs you to “cheat.” He wants you to instead learn only about a handful of wines that your restaurant offers. Why? Again, because it’s about customer service, and not about retaining a wealth of wine knowledge. If you know enough to suggest a good wine and answer a few basic questions, the customer will have his or her needs met…and that’s, again, the whole point. A lot of what Steve has to say here applies to customer service in general. That’s a field I’ve found great success in, because I like to make people feel better. I can’t always fix their problem, and sometimes there’s genuinely not a problem to fix. But that’s okay, because what they want is to feel better. Something that small really does make the difference between someone who is good at their job, and someone who should probably move on to something they enjoy more. His writing style is a big brusque, which can seem a little dismissive or callous, but ultimately he’s hammering home a very simple point: you can do better. There’s always one more thing to learn (whether it’s where the spare sippy cups are kept or how to get to the nearest bookstore) and you can always deploy that knowledge to make your customers happier…and thereby earn higher tips. It’s a win-win-win: if you get more tips, you’re happier. If you’re getting more tips, that also means your customers are happier. And if your customers are happier, your restaurant benefits both from having those customers and from having a great waiter. It’s an excellent way to realign perspective, regardless of what line of work you’re in. However the presentation of Earn More Tips is a bit lacking. Steve set out to write a book that you could read before a shift (it’s only around 80 pages long) and immediately put into practice what you’ve read. On that note, he’s succeeded. For someone looking for text that’s a bit more in-depth, citing research or social experiments, exploring the psychology of customer interaction…they might want to keep looking. The book can sometimes read like a transcript of somebody giving a great PowerPoint presentation; it feels like you’re getting the overview without the details. Steve, I’m sure, would argue that that’s what he set out to do. ** That’s totally fair. But, personally, I’d love to see a more in-depth followup designed to sit on a shelf and be referenced by managers building their staffs, to complement the approach of this one which is designed to be read in a car or a break room waiting for a shift to start. There are also a few annoying spelling and grammatical issues, as well as some formatting choices that work against clarity. For instance, Steve’s major points are given box-outs to help them stand out. This is fine, except that they often rely on what came just before in the text, and sometimes the text that follows responds to it, meaning the eye is drawn to these boxes first, when really everything needs to be read in sequence anyway. It’s not a major problem, but one worth pointing out. It’s certainly made up for by Steve’s conviction, and also the simple fact that he’s right; you really can do better, whoever you are, and whatever you do. His advice is simple, because it doesn’t take much to give somebody a better night than they would have had otherwise. * In my very first customer service job, a coworker gave me this exact advice. It’s not worth relaying the context; it’s stuck with me ever since, and context has changed a thousand times over. ** He’d also argue that I should be referring to them as “guests” instead of “customers.” He’s right. Old habits die hard.